We are excited to announce the Inaugural New Years Race, Los Angeles at Night! On Saturday NIGHT, January 5th, 2013, we will be hosting a 1/2 Marathon, Resolution 5k and Kids Fun Run to kick off the New Year! The New Years Race Los Angeles course offers its runners an awe-inspiring and totally unique tour of downtown Los Angeles -- A NIGHT RACE under the glow of the bright city lights. The course starts on 7th Street and Grand Avenue which is known as the Taste of Downtown. The finish line will bring you next to the exciting new L.A. Live complex and guides participants through hotspots that mark the new generation of downtown living and some of the oldest historical landmarks of the city. 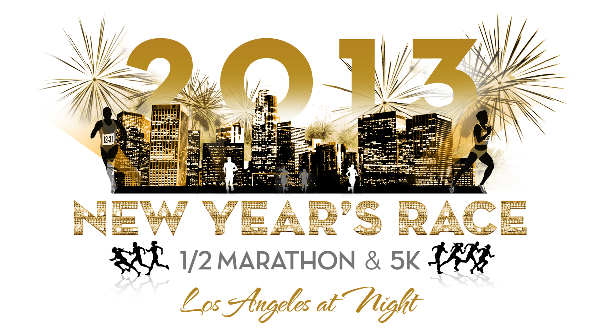 Continue to follow us on Facebook as we unveil the course.Event schedule and timesThe New Years Race Los Angeles is scheduled for Saturday NIGHT January 5th, 2013 at 9:00pm. Ready to race? Register now and enjoy your New Years Race Los Angeles!